Change is good. So they say. Change is sometimes good, sometimes bad, but it’s unavoidable. There will be two notable changes–one in Greater Vancouver and the other all across Canada–that are products of the signs of the times. Mailing a letter in Canada became a lot more expensive as of March 31st. It’s been official since March 31st to be exact. However it was in November when the news hit the fan. Then Canada Post announced major changes that would take place: some that would take place within months and some within years. One was the reduction, if not the complete elimination, of mail home delivery and designating it to neighborhood post office boxes. This was something to affect 80% of Canadian households over a five year time. Another was a do-away with thousands of postal jobs. Canada Post plans to ‘retire’ jobs just as many of its employees are reaching retirement age rather than have huge layoffs. 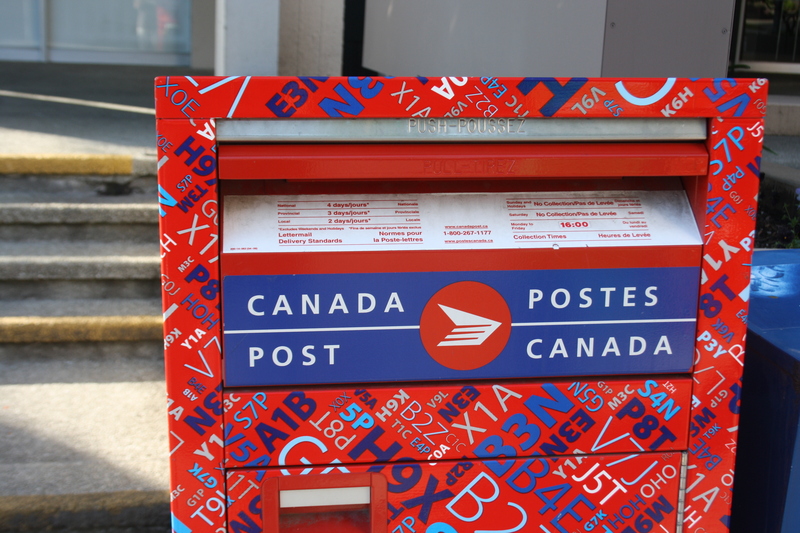 However the biggest news had to be huge increases to the price of postage–the biggest ever in Canada Post’s history– for the average customer. One example is the price of single Canadian stamp for a simple basic letter anywhere in Canada to be $1 each or $8.50 for a book of ten. That’s up from $.63 each the year before. No kidding it was a shock to all those that heard it. But in all fairness, it’s pretty much a sign of the times, albeit a rude sign. When you look at it, less people–especially the young– send out lettermail. They send it via email, whether it be in the form or regular mail-style communication or greeting cards. Even payments are sent by cheque less often and have mostly been replaced by wired payments. In fact Canada Post announced the billions of dollars in total it has lost over the last few years. If you saw things through Canada Post’s point of view, you could understand why these shocking changes. One increase in postal use has occurred in recent years has been the increase in parcels and packages. You can thank modern technology for that too. More specifically online shopping that has resulted in the increased packages. that’s one thing that’s keeping the postal workers in business and working. Before Canada Post would make changes they’ve been intending to do for a long time, they consulted the public. They had group meetings with people from all around the country. They even invited feedback via email. So this isn’t something that they did as run-of-the-mill. They actually paid attention to what was out there and took note. However it’s not to say they may have missed some details. The biggest flack came in concern of elderly people who can’t make it to those anticipated boxes, or not without huge effort. If there’s one saving grace about this, it’s that businesses get a bigger break from this. Businesses also have their own dealings with the new postal rate increases. Fortunately Canada Post is very understanding how businesses rely on paper mail. I myself work for a business that sends out a lot of paper mail and I know of the graces given to businesses. One is postal rates given to businesses using indicia print mail. Businesses can pay anywhere between five to twenty percent less than what the average customer pays at the counter. One example is while the average person pays $.85 per stamp for a book of ten, businesses can pay $.75 per piece even if it’s just one to go. The savings get even better in terms of bulk mailing on the Electronic Shipping Tools (EST). Sending bulk mail via EST was already a good savings before as businesses could save two cents per piece as long as the batch was a minimum of 5000: a savings of at least $100 per batch. Now the price is $.70 per piece–a savings of five cents each– and the batch minimum for this savings has been reduced to 1000. It looks as though Canada Post was most prepared for businesses and did what it could so they wouldn’t take as huge a blow as the customer. No doubt there have been complaints about this all. I cannot blame the people for complaining. In fact I don’t like paying $1 for a single stamp, and this is as a basic customer. Nevertheless I think of all the changes that have occurred on how people deal with mail, especially in terms of technology, and I sometimes feel like saying to them: “If you decrease the postal system’s usefulness to yourself and others, you have this coming.” Sometimes I really feel like saying just that. One more thing. American conservatives have liked the new system and some are considering it as a template for changes in the American postal system. Oh, a footnote. You know how I mentioned Canada Post’s plans to ‘retire’ certain positions than lay off. Well there were was an announcement of a certain number of carriers in three major Canadian cities being laid off. I guess they didn’t want to wait. 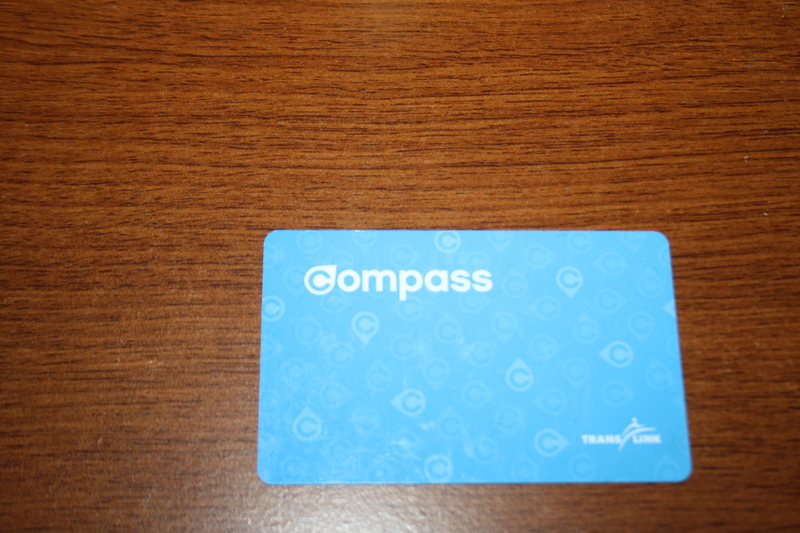 The Compass card from TransLink. The program was expected to start January 1st but still lacks a definite start date. Okay, I’ve already talked about one change that’s already happened. Now I’ll talk about a change that was supposed to have happened fully already but is only happening partially. For those who don’t know Greater Vancouver transit system, people simply buy their tickets and board the trains. Sounds like a good opportunity for freeloading but Transit Police frequently board the trains to inspect. Those caught without proof of appropriate fare get fined $160. Buses are pretty regular where customers pay up front, allowing little opportunity for fare evasion. Just two years ago, Greater Vancouver’s transit authority TransLink started set up of new turnstiles for the Skytrains. It’s not just for the sake of restricting access to people who have paid their fare but also to equip for for the new electronic way of boarding transit. TransLink announced plans to start the new Compass program where people use a computer sensor card to tap in and tap out of buses and trains. Compass cards and their value are paid for at special fare booths at Skytrain stations. The cards are a lot like how some use a chip credit card to tap in their charge at some terminals. TransLink had plans for the program to start on January 1, 2014. However they invited people from the general public to become testers of the Compass card system during a three-week period starting in September 2013 and ending October 1st. I was one of the people who signed up to volunteer and I was selected to participate in the testing period. I received my card in the mail and used it tapping in and out of buses and SkyTrains. Tapping in wasn’t the hard part. Tapping out was as I forgot at least five times completely. There were a few times I’d forget to tap out of the SkyTrain and then head back to the turnstile to register. One purpose was for TransLink to get an understanding of people’s transportation patterns. Another was to get a sense of how transit passengers dealt with and felt about the upcoming system. they even invited emails under usernames to get the feedback they wanted. It was a mixed bag of what to expect. Even before the testing period, I remember one bus driver saying that the Compass system is going to create mayhem. I take that with a grain of salt because I’ve lived in Vancouver long enough to know there are lots of Vancouverites that mourn “Doomsday!” over everything.Actually I’ve seen people in Quebec City use a fob-style method of payment on buses as far back as 2009. I’m sure there are many more cities in Canada and around the world that have adopted their own electronic fare system. So this Compass thing is actually something Vancouver and TransLink should have caught onto a long time ago. However I don’t feel Compass should replace fare payments as some people may not need the card due to infrequent TransLink travel. Compass is more for people like me who bus day in-day out. One drawback about this is that TransLink users that were part of an employee pass program–where employees received passes for a monthly fee that was a 15% discount from monthly bus pass rates– were told the employee pass program would expire December 31st of the year. Many people, including myself, were disappointed but TransLink made it clear that this was a sale and sales do end. The public were told people would pay a monthly rate via Compass that’s less than that of the current regular bus passes. Anyways it’s May, more than four months after the original planned date of the Compass changeover, and I’m still waiting. I’m also back to paying the regular monthly bus pass rate. Compass may not be available to the general public as of yet but it is open to certain people. Some people who are part of disability programs or assistance programs already have access to Compass as the general public are still waiting. TransLink even admits on their website that they’re ‘rolling out Compass one group at a time.’ Now that we’re talking about TransLink’s website, TransLink also has a section on their website devoted to Compass and their answers to FAQs like security and privacy concerns. One thing that’s still unanswered is the start date for the general public. They say the start will be spring/summer 2014. It’s already May and there’s no official start date yet. Guess it’s just the waiting game right now. So there you have it. Changed happening in 2014. One nationwide, one strictly in Greater Vancouver. One partially for the better, one for the worse. One happened on their projected start date, one is still four months past it’s official start. Both however are signs of the changing times and changing needs of the public.